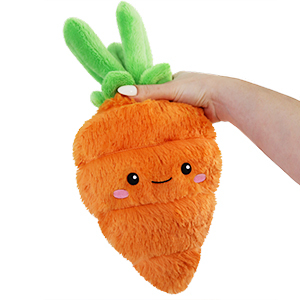 Mini Comfort Food Carrot: An Adorable Fuzzy Plush to Snurfle and Squeeze! Did you know if you eat too many carrots, your skin turns orange? The Mini Comfort Food Carrot cries foul! There is no such thing as too many carrots! So bask in that beachy beta carotene glow, this guy is only rich in fluff and cuteness. Scientifically proven. Indeed! I just received my little carrot Carol in the mail today and as soon as I unboxed her I was blown away with cuteness! She's incredibly soft and cuddly and THE cutest carrot around. Highly recommend this squish!